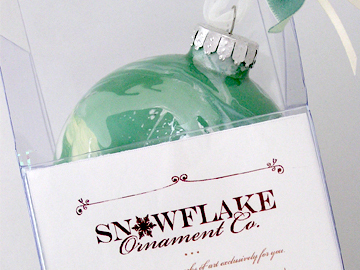 Snowflake Ornament Company has been creating custom ornaments since 1993. Want to be added to our list? Email us your feedback. .... and many more business professionals, gift shops, organizations, and individuals. Just wanted to let you know that I just received the ornament today. It looks wonderful, the colors are perfect. I'm sure she will absolutely love it! Thanks so much, and thank you for getting it here in such good time. Worked out perfectly, and I will surely direct everyone who asks about it to your website with my highest compliments. Thanks! I received the ornaments and they are beautiful! Thank you! XO!! 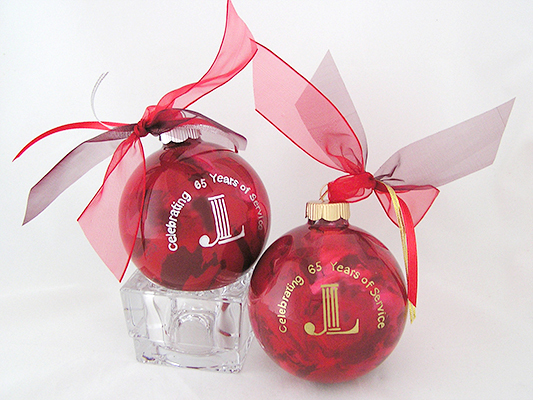 "I just wanted to quickly let you know my ornaments arrived safely and they are beautiful. I can't wait for the family to see them. I'm keeping them a secret for now! I already know how I will use the extra ornaments. I will tie them on a gold ribbon and attach the ribbon to a mirror in my dining room and let them drape down the mirror from side to side. I wanted to let you know I received the ornament yesterday, and I love it! I can't wait to give it to my nephew's new baby. Thank you for wrapping the ornament so it arrived here safe. Thank you so much for everything! "The Huntington County unit of the American Cancer Society purchased ornaments for our annual Relay For Life. We then gave these ornaments, decorated so beautifully in the Relay colors, to our cancer survivors. "I just want to thank you for the fast delivery and the bulbs are absolutely breath taking. Thank you so much I will be back next year."